Grab some friends. Pour a drink. Let's get knitting! Want to learn to knit but don't know where to start? Attend one of our modern knitting workshops or host your own. All workshops are great for anyone ages 10 or above. Gift certificates also available. Grab yours here. You will also learn how to read a yarn label and knitting patterns. With these foundational skills you will be able to create a variety of your own cozy modern knits. By the end of the class we will get started on your very first project - a headband (pictured above) or scarf - you choose! Each participant will receive a knit kit with all the materials needed to get started, not to mention a pretty awesome time out to meet people, mingle and knit! This workshop is ideal for beginners. No experience necessary. Book early! Workshops are limited to 8 people to allow for plenty of one-on-one attention. Location: David's Tea, 95 King St S, Waterloo (facing Willis Way), unless otherwise noted. Friday April 26th, 2019. 6:30-8:30pm. Register here. Friday May 17th, 2019. 6:30-8:30pm. Register here. Or book your own private workshop. See details below. For those who have taken the Learn to Knit class and want to kick things up a notch. Learn to knit in the round using circular needles. This technique is used for making hats, cowls, boot cuffs, infinity scarves, and more - without any pesky seams! You will also learn how to increase and decrease, add in another colour of yarn and do cables. A jam-packed class sure to advance your knitting skills. Should already know how to cast on and do the knit stitch. We will get started on your first circular knitting project - a simple cowl. Friday May 31, 2019, 6:30-8:30pm, Register here. I will come to you - whether it is your home, workplace or other location. I recommend a table with a seat for everyone or some cozy couches for a comfortable workshop experience. I've also done outdoor picnic-style workshops too - choose whatever works best for you, your guests and your space. 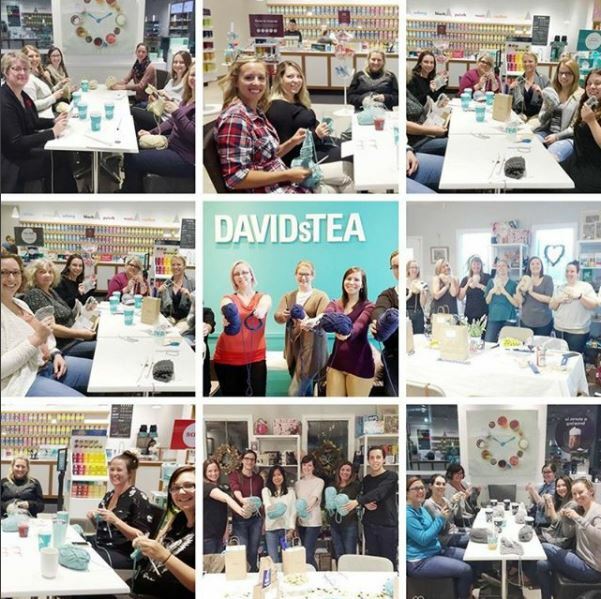 David's Tea in Uptown Waterloo is also an option - search them online to see their hours of operation. Minimum 4 to maximum 10 people with one instructor. Larger groups can also be accommodated upon request. Cost is $50 per person, all supplies included. Now booking in Kitchener-Waterloo, Guelph, London, GTA and surrounding areas. We love our hosts, so with 5 people (6 including the host) then the host is free! We encourage offering a beverage and snacks to make it a more fun social event. Email us at cabinandcoveknits@gmail.com to set a date. We will then create an online registration link for you to share with your friends. Looking forward to some crafty time together!